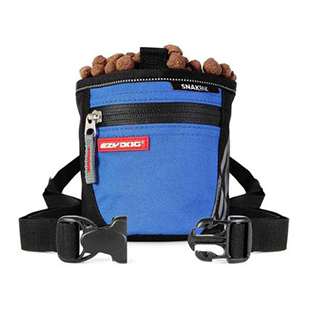 Zero Shock Technology cushions and eases the pressure for both the owner and dog. We used the EZYDOG shock absorbing leash extension today for the first time. This is a GREAT product for us. Because we do not have a yard once every couple of days I take my 6 yo, 12 lb Chiweenie to the park and let him run on a long lead. Usually when he gets to the end of it both of us feel the force of him coming to a abrupt halt. However, today was so much different and better. I felt quite a relief in the amount of breaking force and it would appear that he did too. The first time he seemed surprised and turned around seemingly to say, "Are you still back there??" I didn't really think this was going to make as much of a difference as it does. I am THRILLED I found and tried this item. As other's have stated either making a smaller version or perhaps a lighter alloy for the hardware for small dogs would be my only suggestion. I can finally walk my German Shorthaired Pointer and Boston Terrier together with ease! This extension has been a welcome addition to my Ezy Dog No Shock leash., so glad they exist and what a difference it's made. No chocking g, gaggging, reverse sneezes or pulling--Revolutionary design! I bought this to extend the 4 foot Zero Shock leash. While it serves the purpose of making the leash longer, it also adds weight to the leash with the additional metal ring and clasp that makes it feel awkward to use. I would prefer to just be able to have a 6 foot leash. Also, one thing to consider with the bungee feature of both the leash and the extension is that it does give your dog some extra room to pull away from you if you stop short. So while the feature helps in some cases, it can give you dog room to move a bit forward if you stop short of an obstacle and can't grab the traffic control part or below the bungee part fast enough. 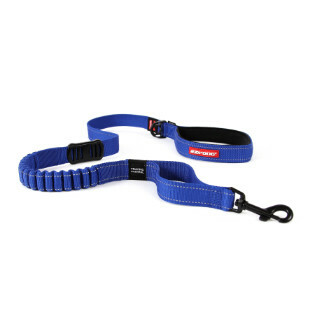 If you add this extension to the Zero Shock leash, you are doubling the areas of expansion on the leash. Unless you can quickly grab below the lowest bungee part, you can't easily stop your dog from moving closer to an object, person or animal you are trying to keep them back from. I love this extender. It's strong and keeps my 85lb girl (Alapaha Bulldog) from getting hurt especially when I'm running and she decides to stop and smell the roses. I also double it and it works great when I let her run next to me without the long leash because it's short enough to not get in her way but strong enough if i need to suddenly grab her for some reason. I thought the last version was great, this one is fabulous! I really like the strength and materials used for the extension. It is extremely well made & sewn. However, for a 13 pound Bichon, it just hangs on and drags onto the ground while Abby is walking, running or even still. I only wish Ezy made it in a smaller, lighter weight version since smaller dogs do need it more, as smaller dogs necks are so much more at risk, then say Pit Bulls, etc. In fact, smaller dogs think they are bigger dogs most days. Larger dogs that are NOT well trained are always pulling on their necks, so I understand why they were formulated in the first place. Owners that don't take the time to train larger aggressive breeds have no one to blame but themselves....they underestimated the larger breeds temperament and are more frustrated than smaller dog owners. I see that all the time on Cesar Milan's dog shows when he has to rescue aggressive larger breeds who have a tendency to frighten the whole neighborhood with the owners being pulled around by unruly dogs that cause havoc.